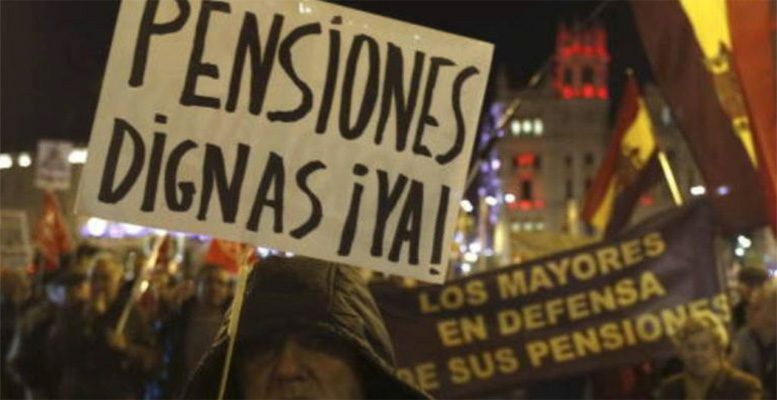 The perception only that pensioners and health spending have lost purchasing power in Spain is not altogether true. We can see this in the data. According to calculations in a recent posting in the economics blog NadaEsGratis by the economists José E. Bosca, Rafael Domenech and Javier Ferri, compared to the beginning of the crisis, the UK has a level of public spending per capita only 3% higher (look at what real austerity means in graph 1), the US 13% and Spain 15% (excluding interest). In graph 1 the evolution of current public spending per capita and net interest payments are compared for Spain, the US and the UK, taking 2007 as the last year before the crisis. 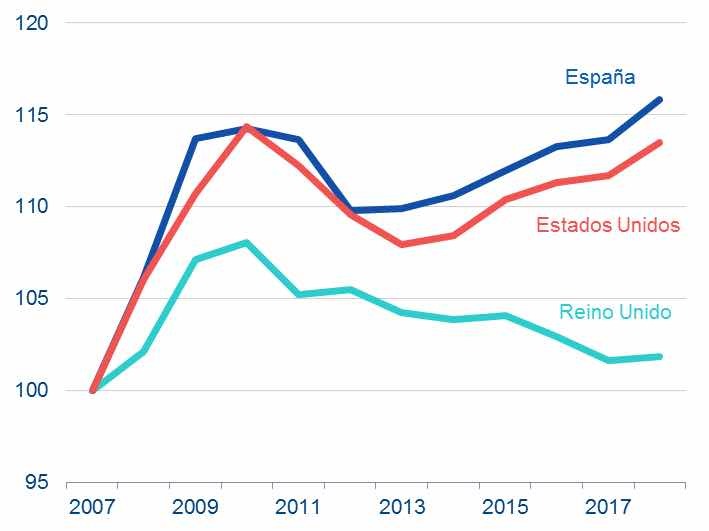 We can clearly appreciate the expansionary reaction in fiscal policy in the first years of the crisis and the subsequent correction, which in Spain is especially evident in 2012, during the most delicate moment in the sovereign debt crisis. It is striking that, even in the toughest moments in the correction of public spending, it was still 10% greater than that observed in the last expansionary year. At the end of 2018, the European Commission´s forecasts suggest that current public spending per capita (in real terms) will exceed by more than 15% the pre-crisis level, more than the US or the UK. Public spending % per capita. (Current public sepnding in real terms and pwer capita excluding interest payments for 2007-2018 (2007 = 100). Source: AMECO, with October 2018 forecasts. In other words, there has been a real fiscal adjustment in the UK, but not in the US or Spain. Now comes the second part: where is this disproportionate increase in spending going? Well, firstly, to pensions. Secondly, unemployment, which in the four worst years of the crisis reached 30 billion euros. Thirdly, health and education spending. According to the calculations of Bosca, Domenech and Ferri, even in the worst moment of the crisis the per capita spending on health and education was never less than in 2007, and now it is 8% higher. All this means that the reality we have lived, convulsed by more or less peaceful demonstrations by interests groups, has been manipulated. Neither the previous government not the actual one has made a minimal effort to explain this to the Spaniards who pay the taxes. To sustain its argument, the government has been forced to raise taxes, even though net government debt keeps growing. When Spain stands out for its public debt of 100% of GDP, and for the highest unemployment rate in the world, it cannot be argued that this fiscal policy is a Keynesian one which feeds back into itself, when the growth induced by fiscal spending covers sufficiently the increase in the deficit. For this kind of policy to work – which can work as we see in Sweden – it is absolutely necessary to save in times of growth and to leave the intertemporal deficit in zero, which is what is important. Here we can see the GDP per capita of various countries since 2002. Spain is the dotted line. The values are at constant prices in dollars. The first thing which strikes us is the notable difference between the crisis in Spain and the other countries. In any case, we are weighed down by a permanent deficit in income at the personal level, even though in 1975, on the death of the previous regime, we promised ourselves we would be very happy with democracy and its thaumaturgical effects on the economy. The gap has been growing for various reasons, the first of which is productivity. Income per capita is a rough measure, albeit not exact, of productivity (it is the quantity of GDP per worker, the other is the quantity of GDP per population, but it is obvious that the greater the former, the greater the resources to sustain the level of the population). Productivity in turn depends on technological innovation, which increases the product obtained per worker, which increases the added value per company and, in the end, profits and wages. My reflection is that the growing slump is a failure of the Spanish economy. Better put, of the institutional regime developed since the Constitution, which I personally attribute to the complete failure of the autonomous regions.